In preparation for writing some new material for Seven Voyages of Zylarthen, I made an Excel spreadsheet of most of the canonical old school spells. Others have put together similar lists, but I haven't found any that did it in this format. If you like, you may download it from my public Dropbox here. I hope you find it useful. The spreadsheet has a distinct line for each spell (including an additional line for its reversed version, if applicable) and lists which publication(s) it appeared in, including how it was named and numbered within that publication. I did this fairly quickly so undoubtedly I made some mistakes. If anyone finds any, I would be grateful if you would point them out. I included the Illusionist spells in Strategic Review #4 because they would later become part of the canon. I did not include any other spells from Strategic Review or Dragon Magazine, although some would of course turn up later in Players Handbook or Unearthed Arcana. The publication dates are rough and may be off by a month or two. Obviously some spells had their genesis before they were officially published. The Cook Expert set seemed to include one spell - Striking - which I could not find in any other source. That seems odd to me and it's possible I missed the fact that it has some other name in AD&D. I didn't include cantrips. I am not a masochist or insane. Each distinct spell also includes its lowest and highest level according to the different versions by class and publication. All but 17 spells varied by no more than one level. 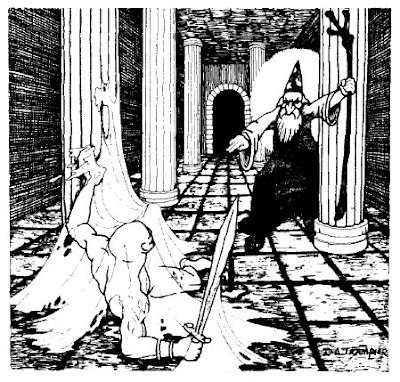 The three greatest variances were Maze - 9th level Magic-User spell in Greyhawk, 5th level Illusionist spell in Players Handbook - Confusion and Create Water - 1st level Cleric spell in Players Handbook, 4th level Cleric spell in Cook Expert. Obviously, the precise description of these spells varied accordingly. Each spell also points to its reversed version, if any. The spreadsheet also lists its Zylarthen counterpart, if any. As many of you know, for Zylarthen I ditched the Cleric as a player character, but gave non-player character High Priests, Evil High Priests and Witches their own somewhat distinct lists. In keeping with my methodology of including material only through mid-1975, most 1st to 6th level Magic-User spells from Men & Magic and Greyhawk were included as Zylarthen Magic-User spells, but the list was rounded out with some Cleric spells. High Priests and Evil High Priests were given many of the Cleric spells I didn't use, plus some 7th to 9th level spells from Greyhawk. Witches were given a mix of extra Cleric, high-level Greyhawk and Illusionist spells. So this is the first game of Zylarthen/OD&D that my kids have played. I didn't impose it on them. They asked to play after becoming fascinated with the Fiend Folio and Monster Manual. They don't even really know its name--"Seven Voyages of Zylarthen" or "Dungeons & Dragons" They simply call it "Daddy's game" or "the game with the figures." Oliver and Lydia are almost five. 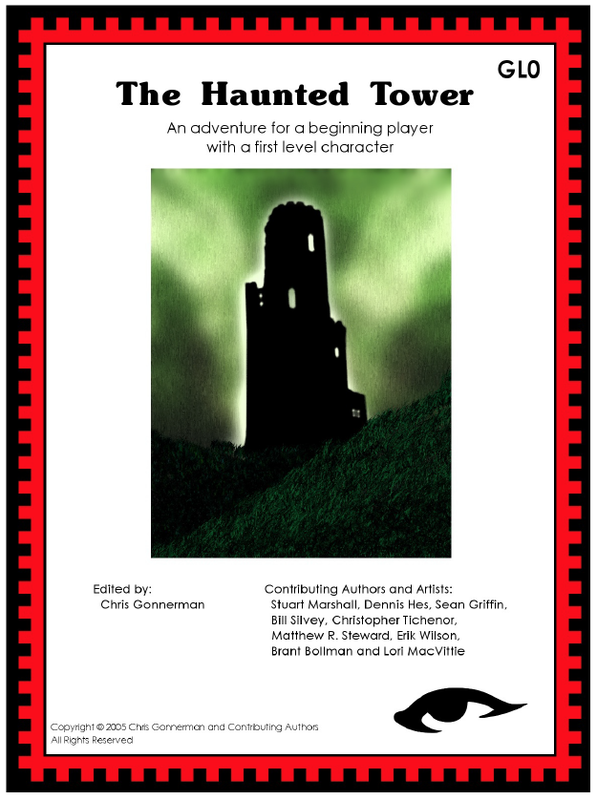 The module is The Haunted Tower by multiple authors, edited by Chris Gonnerman of Basic Fantasy fame. It's designed as an introductory adventure for children. There are all sorts of neat treasures, some fun "kid" monsters such as a Candy Cane Golem, and it is not very lethal--although it is certainly possible to die (and as we'll see, my son almost did). It's designed as a solo module, though one can play with two or three characters and just multiply the monsters (or not). I like the module a lot and I had played it before, five or so years ago, with my nephew. It is available for free download here. If I am occasionally flippant about it, no criticism is intended. The game system is Seven Voyages of Zylarthen, my OD&D neo-clone. The figures are unpainted Ral Parthas from thirty years ago, plus some odds and ends such as some painted and unpainted Call of Cthulhu figures and a few printable paper minis from Arion Games. My daughter said the paper minis looked "really valuable." In Seven Voyages of Zylarthen, you roll 3d6 in order with no mulligans, but ability scores are themselves less determinative or restrictive. If you want to play a Fighting-Man with a strength score of 5, you easily can. So, in a sense, it works for kids who have their own ideas of what might be fun to play. But it's uncanny how often high scores seem to come up by rolling 3d6s. I knew my son wanted to play a "knight." On his very first roll (strength) he got an 18. And no, he didn't cheat. Distinguishing Characteristics: Very strong, wears leather armor, uses a sword and shield and carries a mace for backup, speaks Bugbear (determined randomly) as an additional language. Distinguishing Characteristics: Very dexterous (17--again, rolled with 3d6), wears leather armor, uses a sword and buckler and carries a sling, also carries paint & brushes. Now we also had a third character. Lydia asked whether her doll Betsy could have one. I said, why not? Distinguishing Characteristics: Has a dexterity of 4 and a constitution of 6, knows Read Magic, Pyrotechnics and Speak with Animals, speaks Hill Giant (again, determined randomly). Buying equipment went quickly--much more quickly than it usually does with adults. Without prompting, Lydia drew a picture of her character on her character sheet. Ollie followed. And Lydia drew Linda with a Wizard's hat containing a star. I'm not saying my kids are necessarily any cleverer than the average. But there's an intuitive aspect to the play of the game that children seem to pick up on. They were ready to go. The Haunted Tower has a backstory--something about an alchemist being attacked by a werewolf and thus abandoning (?) his tower. But I found the backstory somewhat confusing (no offense to Chris--I often think that of backstories) and so I ditched it. They were ready to go explore The Haunted Tower, for no other reason than the sheer adventure of it. This is a follow-up to yesterday's post, showing what I came up with. 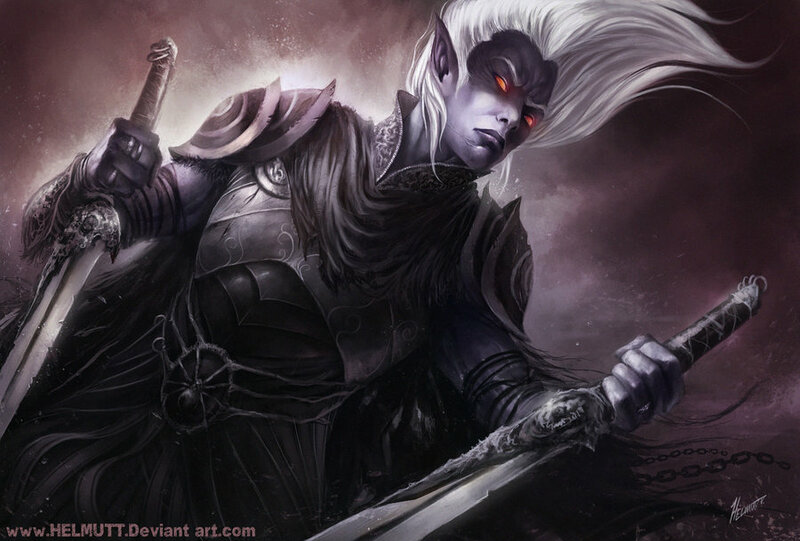 Most obviously, I call them "Dark Elves" not "Drow." If I thought I could do it without offending too many people, I would consider calling them "Black Elves" to make them slightly stranger sounding and to further distinguish them from the AD&D version. GNOMES: Hit Dice: ½. Armor Class: 5. Move: 6/3. Alignment: 50% chance of Law, 50% chance of Neutrality. Languages: Type E. Number Appearing: 40-400. % In Lair: 60%. Treasure: Class 1. Description: Gnomes are barely over 1 foot in height and can move through solid earth (though not necessarily stone) as easily as men move through air. They will only be encountered far beneath “the sunlit lands” in deep dungeons or caverns. Missiles: die 1 = none, die 2-4 = spear, die 5 = sling, die 6 = bow. DARK ELVES: Hit Dice: ½. Attacks: 1-6 - poisoned bolts - spells. 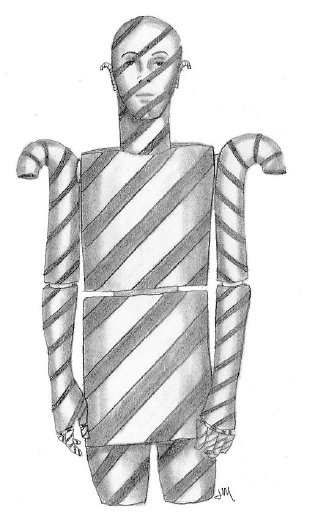 Armor Class: 4. Move: 12. Alignment: Chaos. Languages: Type E. Number Appearing: 5-50. % In Lair: 0%. Treasure: Class 10, plus 5-30 G.P. and 50%: 2-12 gems ea. Description: Dark Elves are the counterparts to Gnomes but unfortunately are much more dangerous. Like Gnomes they are barely over one foot in height. Also like Gnomes, they will only be encountered far beneath “the sunlit lands.” Dark Elves do not have the ability to burrow through the earth, but they may move silently and near-invisibly so as to suddenly appear virtually anywhere (surprising on a 1-4). Due to their small size and use of enchanted weapons and armors, Dark Elves always have a +4 bonus to hit and impose a -4 penalty on those trying to hit them. They fight with a variety of weapons but most also carry a small crossbow that can be operated with one hand—the bolts being envenomed and causing sleep (save at -4). All Dark Elves may use these spells once per day: Clairvoyance, Dancing Lights, Darkness, 5’ Radius, Detect Lie, Detect Magic, Dispel Magic, Faerie Fire, Levitate and Suggestion. In addition, for every 10 Dark Elves, there will be a Diabolist. For every 20 Dark Elves there will be an Haruspex. And for every 50 Dark Elves there will be a Prince or Sorceress (each equivalent to a 12th level Wizard). Dark Elf Magic-Users use the same spell lists as Witches. All Dark Elves are 50% resistant to spells. Dancing Lights: At a range of up to 100’ the caster may create either: a) 1-4 lights that look in the darkness like bobbing torches or lanterns, b) glowing or blinking “will-o-wisp” like spheres or c) a faintly glowing man-like shape. These shapes may move as desired within the range of the spell. Duration: 10 melee turns. Faerie Fire: This spell allows the caster to draw an outline of blue “Faerie Fire” around one or more objects or creatures. The Faerie Fire will be visible for 80’ in the dark and 40’ in bright light and may even make invisible creatures visible. An outline of to 60’ length may be drawn—equivalent to four man-sized creatures, spaced fairly closely together. Being outlined in such a way is not in and of itself harmful but it will give opponents a +2 bonus to hit. Duration: 20 melee turns, Range: 80’.